NSF International, The Public Health and Safety Company™, a not-for-profit, non-governmental organization, is the world leader in standards development, product certification, education, and risk-management for public health and safety. NSF is widely recognized for its scientific and technical expertise in the health and environmental sciences. 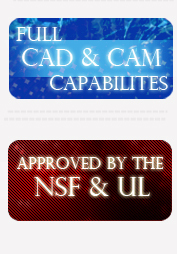 As a leading product safety testing and certification organization, UL is synonymous with safety.